Available as an A5 blank greeting card and a medium sized print 12" x 10". "West Lonmon looks down" Original not for sale. 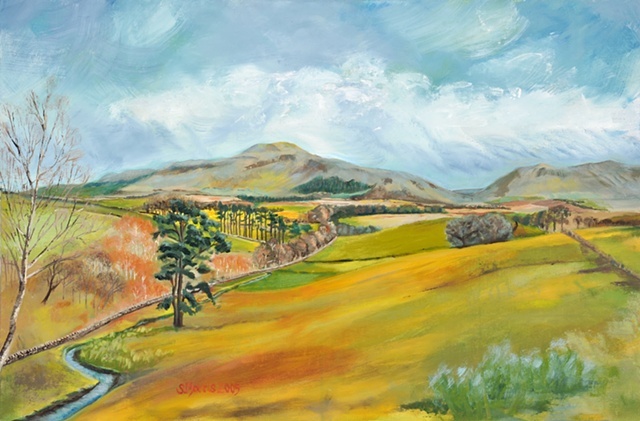 Oil on Canvas 30" x 20"
This hill, part of a range of the Falkland Hills, has views over half of Southern Scotland, when driving back to Perth from the North or South it is a 'marker' for home. The title for this painting comes from a poem by Norman Nicholson about Scafell. He had strong feelings about nuclear power, as do I, and wrote 'Windscale' one line of which is: Scafell looks down from the bracken band. In the case of West Lomond it has views as far as Dunbar where there is a nuclear power station 'Torness'.